After a difficult and eventful ride through the Occupied West Bank, the Peace Cycle finally rode into Jerusalem on Friday 15th September. 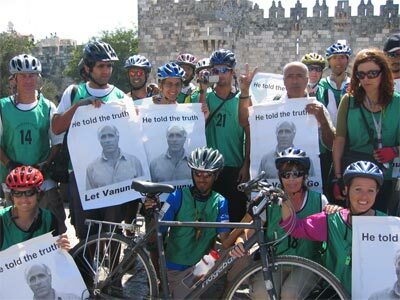 The cyclists were delighted to be met at Jerusalem's Damascus Gate by Mordechai Vanunu, who was imprisoned by Israel for 18 years after exposing it's secret nuclear weapons programme, and who is still being held in Israel against his will. Vanunu is one of the Patrons of the Peace Cycle, and he greeted the cyclists warmly before spending the afternoon touring parts of the city with them. The arrival in Jerusalem was an emotional moment for the Peace Cyclists, after completing a 2500km ride across Europe and the Middle East. This epic mission for peace and justice covered 10 countries and included climbing the Alps, but nothing could have prepared the cyclists for the physical and emotional journey they experienced in Occupied Palestine. The ride was constantly harassed and hindered by the Israeli military and police, starting with an eight hour ordeal at the border crossing from Jordan, a further three hour wait at a checkpoint once they entered the West Bank, and a seven hour wait as they were detained at another checkpoint near to the northern West Bank town of Jenin. Even when the ride eventually got back on schedule, the Israeli authorities seemed determined to make things difficult for the cyclists, forcing them to re-route the ride on several occasions. The cyclists, however, were inspired by the Palestinian spirit of "Samoud" - a steadfastness, a refusal to give in - and they were all the more determined to visit the Palestinian people they had come all this way to meet. So the Peace Cyclists rode into the towns of Tulkarm, Qalqiliya, Nablus, Ramallah, Bethlehem, Hebron, Jerusalem, and many villages on the way, and were welcomed warmly by the Palestinian population who asked that they voice their cry for peace to the rest of the world. Most of the cyclists had not visited Palestine before, and were visibly shocked when faced with the reality of occupation. The twenty four men and women from different backgrounds and nationalities became witness to checkpoints, roadblocks, demolished homes, ruined lands, separated families, and the horrific sight of "the wall" - an ugly mass of concrete in some places, fencing and razor wire in others - which cuts deep inside Palestinian territory and destroys the very fabric of human existence. Once in Jerusalem, the cyclists met with representatives of the Israeli Committee Against House Demolitions, the Palestinian Agricultural Relief Committees, and with the YWCA and YMCA Joint Initiatives in Palestine. The ride ended with a return trip to Jenin - the town the Israeli forces had prevented the cyclists from entering at the start of their journey, but which they were determined to visit. Once inside the town, they met the children at The Freedom Theatre and played a musical medley to them using bicycles as instruments, and then toured Jenin refugee camp, a place where the brutality of occupation is as evident as the indomitable spirit of the Palestinian people. Another Peace Cycle has ended, but the movement against the injustice of occupation has become stronger and more determined than ever. If you would like to arrange phone interviews with the cyclists at any point please contact TPC Press Officer Claire Ranyard (07801 263322) or Laura Abraham the founder of the Peace Cycle (07941056616) . Click here to read the weblog of a Peace Cyclist"
Click on the map below to see the Peace Cycle route. 3,871 Palestinians and 1,084 Israelis have been killed. 722 of those Palestinians and 121 of those Israelis were children. 29,786 Palestinians and 7,633 Israelis have been seriously injured. 9,492 Palestinians are being held in Israeli jails, many without trial. 4,170 Palestinian homes have been destroyed, some with the families still inside. We believe that every one of those deaths and injuries was unnecessary and the direct result of the occupation and the hatred it breeds. Peace cannot exist between two people when one is occupying and oppressing the other. Israel's occupation of the Palestinian Territories is illegal under International Law and must end immediately, without preconditions or demands. 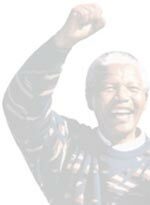 Our message is that lasting peace can only be achieved when justice and equality exists for all. We believe that acts of violence will lead to more acts of violence. Our hope is that acts of peace will lead to more acts of peace. Lots of cyclists turned up in support of the first part of the Peace Ride from London to Greenwich. 1.To encourage people from all over the world to take part in a peaceful demonstration to bring an end to the cycle of violence and begin a cycle of peace in the Middle East. 2.To raise public awareness of the Israeli occupation of Palestinian land and how it affects the lives of the people in the region, and to call for an end to this occupation as stipulated in United Nations Resolution 242. 3.To show solidarity with those who continue to live in fear and turmoil as a result of the occupation and in particular, to call for justice for the Palestinian people as being the only way to a lasting peace for all people in Israel and Palestine. A campaign to rebuild the children's theatre in Jenin Refugee Camp, which was destroyed by the Israeli Army in 2002. "I am delighted to give my full support to the Peace Cycle. It is a movement of compassion and of hope. It allows people to do something positive about a negative situation. In these increasingly dangerous times, we must speak out against injustice and we must work to rid the world of the nuclear weapons stockpiled by Israel and other countries, which endanger all of mankind. I urge people of conscience to support the Peace Cycle in their efforts for justice and peace. Together, we will not allow our spirit to be crushed." Mordechai Vanunu, Peace Cycle Patron, speaking in Jerusalem, 5th September, 2005. "Israel has deprived millions of Palestinians of their liberty and property. It has perpetuated a system of gross racial discrimination and inequality. It has systematically incarcerated and tortured thousands of Palestinians, contrary to the rules of international law. It has, in particular, waged a war against a civilian population, in particular children.....Palestine is one of the great moral causes of our time.